Anyone who operates any type of legal business should have insurance; after all, business owners and entrepreneurs should be able to protect their customers, their employees, and themselves should something go wrong. Many insurance agents are happy to cover many types of businesses, from restaurants to boutiques to retail shops. However, there may be some that feel hesitant to insure craft breweries and wineries. This reluctance may stem from a variety of concerns. For example, some agents may be unsure of how to deal with businesses that produce alcohol, or they may be reluctant because they think making wine or beer is too complicated and therefore involves too many moving parts. However, if you limit yourself to only servicing customers that are in traditional industries, you might be doing yourself a disservice. There are many opportunities in the brew pub and winery industry, and by zeroing in on these, you might find a profitable niche that can help grow your book of business. Hopefully, after you’ve read this blog post, you can make an informed decision and decide if going after these business is right for your agency. Why Offer Insurance to Craft Breweries and Wineries? Now you may be wondering why you should even bother to seek out opportunities in this market. The answer, of course, is quite simple. Craft breweries and wineries have seen an explosion in the last couple of years. It used to be, home brewers were thought of as small time operators, experimenting and concocting drinks out of their basements. Wine-making kits and materials to make beer became more accessible and cheaper, thanks to technology, plus the internet allowed aficionados and would-be brewers to connect easily. So it’s obvious: more and more people are getting into craft brewing. You might even have seen many opening up near your area or even see events centered around craft beers in big cities near you. For example, from February to June of this year alone, Eventbrite for San Francisco Bay Area, where I live, shows me six events that involve craft brews. One of my wife’s favorite breweries is “BV” Beaulieu Vineyard–they also have several events each year at their winery located in Napa Valley. While you’re there, be sure to have lunch, brunch or dinner at Rutherford’s (just across the parking lot). We recently had a wonderful time at these two venues. And what about wineries? Well, you might think outside Napa Valley, there aren’t a whole lot of wineries in the US. Think again. According to Wine Business Monthly’s database, the number of wineries in the country reached 9091 in 2017, a 4.5% increase from 2016. So, still think wineries and brew pubs aren’t worth going after? 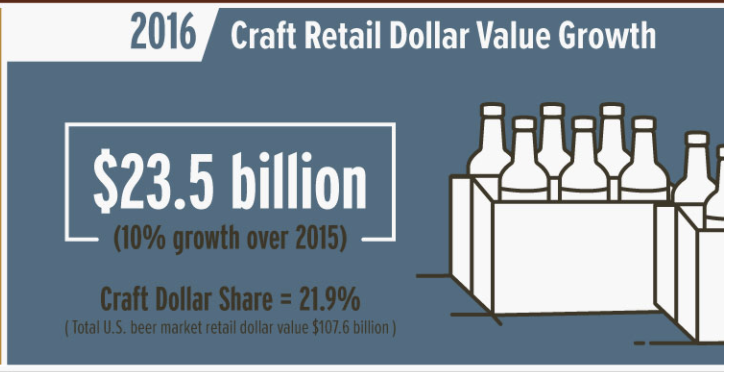 Well, how about the fact that the retail value growth of craft beers reached $23.5 Billion in 2016? The wine industry is no lightweight either. They have yearly revenue of about $21 Billion each year. What Type of Insurance Do Breweries and Wineries Need? So, if you’re thinking about offering insurance for breweries and wineries, you should probably think about which products you should offer them. More often than not, entrepreneurs and business owners may come to you asking for your advice. While some may do their research or already have experience running a business, there may be others who will need your guidance. General Commercial Liability insurance is a must for any business. This covers people who interact with a business, from customers and employees, to contractors to vendors. If any of these people file a legal action against the business, then this type of insurance helps protect the owners. Workers Compensation covers employees for work-related injuries. With so many types of specialty equipment and processes when making wine or beer, this is one type of insurance no business should do without. Property insurance protects the premises from damage and sometimes, element exposure. Business Income insurance can come in handy if the winery or brewery experiences an interruption in operations. Liquor liability insurance protects establishments that serve or make alcohol available. It’s only safe to assume that people will become intoxicated by the products made at these establishments, which could lead to injury or damage. Additional / Umbrella coverage. There are so many ingredients and moving parts that are involved in making wine and beer. What if the hops delivery was late? What if there was a cold snap and the grapes froze? What if pests got into the facility where the yeast was stored? These are just some of the things that owners have to think about. These are just the basic types of insurance you can offer any business. These days, things like cyber risk insurance, pollution insurance, employment practice liability are just some of the products these businesses may need. How Can You Get in Front of Brew Pub and Winery Owners? If you’ve read this far, then you may have already done research if there are even any wineries and breweries in your coverage area (or if your local county laws allow for such establishments). So, how can you add them to your book of business? Actually visiting these establishments and business owners could be the best way to start. You can see them for yourself if they offer a tour or actually have a restaurant or retail shop on-premises. Leave your card or offer to send them more information. Of course, the downside to this is that many established places already have insurance, but you might luck out on timing or when it’s time to review their insurance needs, the owner might call you for a quote. However, one of the best ways you help drum up more policies to add to your book would be to actually educate yourself and be part of the community. There are many wine or beer enthusiast groups all over the country. If you’re truly invested in this niche, then you can start by joining these groups and actually get to know the people and the process. After all, many craft brewers and winemakers start off as enthusiasts. Next, you also want to make sure these people can find you. That said, your agency should pop up in search results when business owners search for “winery insurance near me” or “getting brewery insurance in X county”. You should also have a social media presence, as many of the younger business owners are young, tech-savvy Millennials who do lots of business from their smartphones. By connecting with business owners and showing genuine interest in their craft, you can add another profitable niche to your book of business.